We don't charge you a penny to come into our London studios and have our professional photographers take eye-catching and iconic pictures of you and your family - You only pay for the pictures you want. Take a look at our family portfolio to see a examples of our family pictures. 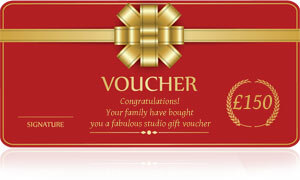 You can also visit Studios4u.co.uk which is our purpose built studio website. To get the most from your family photo shoot bring something dark and something light as we normally shoot on a white or black background. Also, think about how your clothing is going to coordinate with the rest of the family..
Do a little research on the internet and come in with an idea of the kind of poses you can see yourself and your family doing in our studios.